Original data on Dolichopodidae from the Belomorsk district of Karelia and Bolshoi Solovetskii Island (Arkhangelsk Region, Primorskii district) resulted from the short-term visit (2018) are presented. All ten collected species and the genus Medetera are firstly recorded for the Solovetskiye Islands. Dolichopus discifer Stannius, 1831, Dolichopus ungulatus (Linnaeus, 1758), Rhaphium laticorne (Fallén, 1823), Sympycnus pulicarius (Fallén) and Syntormon tarsatus (Fallén, 1823) are new species for the Arkhangelsk Region. Photographs of habitats of dolichopodid species are included. Frey, R. (1915). Zur Kenntnis der Dipterenfauna Finlands III Dolichopodidae. Acta Societatis pro Fauna et Flora Fennica, 40(5), 1–80. Frey, R., 1918. Der Dipterenfauna des nördlichen europäischen Russland. 2. Dipteren aus Archangelsk. Acta Societatis pro Fauna et Flora Fennica, 46(2), 12–13. Grichanov, I.Ya. (2006). A checklist and keys to North European genera and species of Dolichopodidae (Diptera). St.Petersburg: VIZR, 1–120 (Plant Protection News Supplements). Available from: https://diptera.info/downloads/Grichanov_N_Europe.pdf (accessed 27 July 2018). Grichanov, I.Ya. (2017). Alphabetic list of generic and specific names of predatory flies of the epifamily Dolichopodoidae (Diptera). 2nd Edition. St.Petersburg: VIZR, 1–563. (Plant Protection News Supplements, 23). Available from: https://archive.org/download/Grichanov2017DolibankSec/Grichanov%202017%20Dolibank-sec.pdf (accessed 27 July 2018). Grichanov, I.Ya., Polevoi, A.V. (2004). Dolichopodidae of Russian Karelia (Diptera). Zoosystematica Rossica, 2003, 12(2), 271–275. Grichanov, I.Ya., Polevoi, A.V., Ovsyannikova, E.I. (2017). New records of Dolichopodidae (Diptera) from Valaam Island (Russian Karelia). 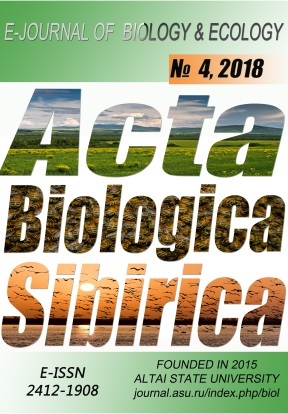 Acta Biologica Sibirica, 3(4), 81–87. Gundakova, L.V. [et al.] (Eds.) (1997). Administrative-territorial division of the Arkhangelsk Governorate and Region in the 18–20th centuries: reference book. Arkhangelsk, 1–413 (in Russian). Humala, A.E., Polevoi, A.V. (1999). On the insect fauna of Karelian coast and islands of the White Sea. In: Gromtsev, A.N., Krutov, V.I. (Eds.). Inventarizatsiya i izuchenie biologicheskogo raznoobraziya na Karel’skom poberezh’e Belogo morya [Biodiversity inventories and studies in the areas of Karelian White Sea coast]: 106–113. Petrozavodsk: Karelian Research Centre RAS (in Russian). Humala, A.E., Polevoi, A.V. (2008). Insects. In: Belkin V.V. [et al.]. Skal’nye landshafty Karel’skogo poberezh’ya Belogo morya: prirodnye osobennosti, khozyaistvennoe osvoenie, mery po sokhraneniyu [Rocky landscapes of the Karelian coast of the White Sea: natural features, economic development, measures for preservation]: 125–136. Petrozavodsk: Karelian Research Centre RAS (in Russian). Humala, A.E., Polevoi, A.V. (2015). Records of rare and noteworthy insect species (Insecta) in the Republic of Karelia. Trudy Karelskogo nauchnogo tsentra RAN, 6, 19–46 (in Russian). Negrobov, O.P. (1974). To fauna of Dolichopodidae (Diptera) of the Laplandskii and Kandalakshskii reserves. In: Problemy izuchenija i ohrany landshaftov [Problems of studying and protection of landscapes]. Voronezh, 43–46 (in Russian). Pryakhina, E.F., Ogibin, B.N. (1970). To fauna and ecology of the dipteran insects living under fir-tree bark in the Arkhangelsk Region. In: Tezisy dokladov k otchetnoi sessii laboratorii lesovedeniya i lesovodstva za 1969 god [Abstracts of reports to the reporting session of Laboratory of Silvics and Forestry for 1969]. Arkhangelsk, 58–61 (in Russian). Stackelberg, A.A. (1962). A list of Diptera of the Leningrad Region. V. Dolichopodidae. Proceedings of the Zoological Institute of the Academy of Sciences of the USSR, 31. Moscow, Leningrad: Izdatelstvo Akademii Nauk, 280–317 (in Russian).